The power of the Mwami (King) was symbolized by a large drum called the kalinga, which translates as “token of hope”. The kalinga was housed in a palace and protected at all times by a guard. It was thought that if the kalinga was ever lost or destroyed, the Rwandan nation would end. Only the nobles and royals of the Kingdom of Rwanda were allowed to touch the drum. Therefore, when His Majesty King Mutara III envisioned this Order in 1959, the drum was the most logical choice to represent the highest Order in the de jure Kingdom. H.M. King Kigeli V created the Order in 1959 and re-affirmed his right to grant this Order on the 3rd of January in 1998. There are two ranks in the Royal Order of the Drum (Kalinga in the native Kinyawrwandan). The higher rank is split into two parts, Grand Collar and Grand Cross, and the lower rank is Commander. A recipient of the Grand Collar is treated as an honorary member of the Royal House of Rwanda, while recipients of the Grand Cross and Commander are not. The Order may be granted as a hereditary award or as a non- hereditary honour. Nobility is conferred upon the grantee. A recipient at the rank of Grand Collar or Grand Cross is entitled to the style of “Son Excellence”. A recipient at the rank of Commander is entitled to the style of “L’honorable”. The title and honour of Chevalier is granted to all male members of the Order whether Grand Collar, Grand Cross, or Commander. Similarly, the title and honour of Dame is granted to all female members of the Order whether Grand Collar, Grand Cross, or Commander. This Order confers nobility upon the member. The post-nominal for a Grand Collar or Grand Cross recipient of the Order is “GCDR”. This stands for [G]rand [C]ollar of the [D]rum of [R]wanda or [G]rand [C]ross of the [D]rum of [R]wanda. The post-nominal for a Commander recipient of the Order is “CDR”. This stands for [C]ommander of the [D]rum of [R]wanda. Therefore, the full name, title, and style of a male holder of the Grand Collar or Grand Cross rank is “Son Excellence Chevalier First Name Middle Name Second Middle Name [if any] Surname, GCDR”. The full name, title, and style of a male holder of the Commander rank is “L’honorable Chevalier First Name Middle Name Second Middle Name [if any] Surname, CDR”. Similarly, the full name, title, and style of a female holder of the Grand Collar or Grand Cross rank is “Son Excellence Dame First Name Middle Name Second Middle Name [if any] Surname, GCDR”. The full name, title, and style of a female holder of the Commander rank is “L’honorable Dame First Name Middle Name Second Middle Name [if any] Surname, CDR”. If the Letters Patent for a particular recipient contains a different style, title, and address than the above, the Letters Patent will triumph only for that particular recipient. Recipients at the rank of Grand Collar are entitled to a collar of gold (Or) chain linking alternating gold (Or) Crowns of Rwanda with the stylized initial “K” (for Kigeli). 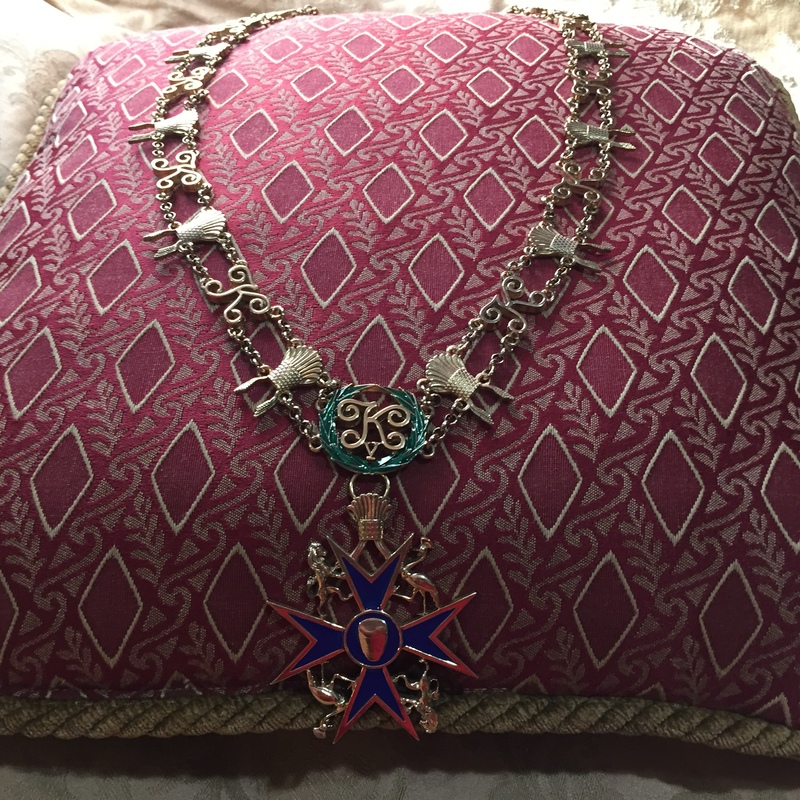 The collar holds the insignia of the Order, which is a royal blue (Azure) enameled Maltese cross of eight points trimmed in gold (Or). In the center of the cross is a royal blue (Azure) roundel bearing a gold (Or) kalinga drum. The outer edge of this roundel is also trimmed in gold (Or). In the northwest corner of the Maltese cross is a gold (Or) lion facing right (Dexter). In the northeast corner of the Maltese cross is a gold (Or) crested crane facing left (Sinister). In the southwest corner of the Maltese cross is a gold (Or) crested crane facing right (Dexter) inverted. In the southeast corner of the Maltese cross is a gold (Or) lion facing left (Sinister) inverted. The whole is surmounted by a gold (Or) Crown of Rwanda. The insignia is approximately 65 millimeters wide from left to right. Recipients at the rank of Grand Cross are entitled to a breast star approximately 90 millimeters wide that is an eight-pointed faceted star of gold (Or) radiating from a center enameled roundel of royal blue (Azure) bearing a gold (Or) kalinga drum. Encircling the center roundel is a band of white enamel (Argent) inscribed “ORDRE ROYAL DU TAMBOUR” in gold (Or). This band’s outer edge is trimmed in gold (Or). The Grand Cross recipient also is entitled to a sash of royal blue (Azure) trimmed in white (Argent). The sash is 100 millimeters wide for males, while females have an option of the 100 millimeter wide sash or else a 50 millimeter wide version. The sash is worn over the right shoulder and it rests on the left hip. The insignia of the Order for the sash is a royal blue (Azure) enameled Maltese cross of eight points trimmed in gold (Or). In the center of the cross is a royal blue (Azure) roundel bearing a gold (Or) kalinga drum. The outer edge of this roundel is also trimmed in gold (Or). In the northwest corner of the Maltese cross is a gold (Or) lion facing right (Dexter). In the northeast corner of the Maltese cross is a gold (Or) crested crane facing left (Sinister). In the southwest corner of the Maltese cross is a gold (Or) crested crane facing right (Dexter) inverted. In the southeast corner of the Maltese cross is a gold (Or) lion facing left (Sinister) inverted. The whole is surmounted by a gold (Or) Crown of Rwanda. The insignia is approximately 65 millimeters wide from left to right. Recipients at the rank of Commander are entitled to a breast star 90 millimeters wide that is an eight-pointed faceted star of silver (Argent) radiating from a center enameled roundel of royal blue (Azure) bearing a silver (Argent) kalinga drum. Encircling the center roundel is a band of white enamel (Argent) inscribed “ORDRE ROYAL DU TAMBOUR” in silver (Argent). This band’s outer edge is trimmed in silver (Argent). There is no courtesy title for the lawful spouse or children of a member of the Order. However, the lawful spouse of a member of the Order is noble for as long as the spouse is married to the member or is the widow/widower of the same. Yet, the children of the member are not noble. The titles and honours of the de jure Kingdom of Rwanda may only pass to another person in strict accordance with this document. They cannot be sold, transferred, or otherwise altered. If a grant of the Order is hereditary, the Letters Patent and it alone will state it. Unless the Letters Patent for a particular grantee specifically stipulates another method of transmission, the default method of transmission is bloodline absolute primogeniture springing solely from the original grantee. That is, the honour and title of Chevalier or Dame will only pass from a current substantive title-holder to the eldest child of the title-holder (or the next in line to the title and honour if there are no living descendants of the current title-holder but there are living collateral descendants elsewhere who spring from the original grantee of the noble title and honour) upon the death of the current title-holder, unless the current title-holder renounces the honour in accordance with Article 54. There may only be one inheritor of the title and honour at any time. The rank within the Order will be retained by transmission. Said another way, a member of the rank of Grand Cross who passes the title and honour to an heir will have the heir also be at the rank of Grand Cross. Likewise, a member of the rank of Commander who passes the title and honour to an heir will have the heir also be at the rank of Commander. The title and honour may be renounced by the current Chevalier or Dame at any time and for any cause. The renunciation must be in writing and witnessed by two individuals not related to the current Chevalier or Dame. Both witnesses should sign and date the renunciation along with the renouncing Chevalier or Dame, and the document should be delivered to the current Head of the Royal House of Rwanda. Upon signing, the title and honour of Chevalier or Dame will pass by the rules of Article 53 as if the renouncing Chevalier or Dame died. Thus, a renunciation of the title and honour does not dissolve it; the title and honour merely passes to the next lawful recipient under Article 53 or the Letters Patent of the original grantee. Per Article 53, only an extinction of the title and honour by the death or renunciation of all bloodline descendants springing from the original grantee, or all eligible recipients outlined in a specific Letters Patent if the specific Letters Patent outlines a different mode of title transmission, can effectively end its existence. Grantees and inheritors of the noble title and honour may display their heraldry with a Bantu-style shield or else a heater-style shield, the above coronet, a helm, a torse, mantling or a manteau, and supporters or a combination of these. Recipients of the Order at any rank may, but are not required to, also display the kalinga drum on his or her escutcheon, but the design may not directly mimic the heraldry of His Majesty King Kigeli V or other future Heads of the Royal House. This prevention of mimicking the design of the Head of the Royal House ensures that the armiger is not accidentally mistaken for His Majesty the Mwami. In accordance with the original vision of H.M. King Mutara III, leopard skin may be used as a manteau. Grantees and inheritors also had the right, beginning with H.M. King Mutara III, to decorate their battle shields, and this is akin to a heraldic system.